The Holley National Hot Rod Reunion (NHRR) came to Beech Bend Raceway June 13 – 16, for its 16th edition, and filled the place with legions of loyal nostalgia-racing fans. Beech Bend Raceway has seen it all over the years. Everything from stockers to nitro burners have wrinkled tires at this historic track. Those in attendance saw the racing action take place on one of the oldest operating drag strips in the country, while taking refuge from direct sunlight in the covered grandstands that line both sides of the track. The “comfortable” seating is by way of wooden stadium seats re-purposed from a nearby baseball venue. The adjacent amusement park and tree-lined grounds are a welcome relief from the miles of asphalt found at most race tracks. The place takes on a homey feel of yesteryear that is hard to pinpoint, but it works well with the atmosphere that vintage drag racing brings to the party. Everything is old and the paint is peeling, but it’s all functional and fits perfectly with the nostalgic vibe of old hot rods and race cars that invade the facility each June over Father’s Day weekend. The NHRR has a tradition of recognizing pioneers of the sport of drag racing at an honoree reception held each year on the Friday evening of the event. This year, that reception moved to the beautiful meeting facilities at the National Corvette Museum, located just a few exits away from the race track. This year’s honorees included Grand Marshall Larry Lombardo, Jay Howell, Bo Laws, Ed Miller, Joe Williamson, and Greg Xakellis. The new location for the reception is a big improvement over the previous site at the race track, and adds a special emphasis to the recognition that the honorees deserve. A mini cacklefest is also held at the reception, and Randy Wall’s Chevy-powered Nova funny car was one of the featured participants at this year’s reception. Race cars with history: Bo Laws' '69 Camaro Pro Stocker, The Larry Lombardo-driven "Grumpy" Jenkins Monza Pro Stock racer, Lombardo's own record-holding Corvette stocker, and Randy Walls' Chevy-powered nitro funny car. The Axalta Show ‘N Shine featured more than 2,000 hot rods and trucks displayed throughout the grounds. These street-oriented hot rods covered a wide range of automotive tastes, but the Chevy faithful were well represented, with many stunning creations that ran the gamut from updated pre-war Stovebolts to restofied muscle-bound Bow Ties from the ’60s and ’70s. The Top-25 entrants were honored Saturday with a ceremony and trip down the Beech Bend quarter-mile. A sizable swap meet is also held at the race track, and can keep the parts scavenger occupied for hours on end. Don Hoover brought his 1955 Chevy 210 sedan from Valparaiso, Indiana, and blew everyone’s mind with the stunning craftsmanship it displayed. Drag racing action is non-stop at the NHRR, with a wide variety of dragsters, funny cars, altereds, gassers, and door-slammers making for a diverse display of modern performance in a vintage package. If there wasn’t a Chevy on the track at any given moment, then chances were high that at least one competitor of each pair in the staging lanes would be Chevy powered. Every conceivable Chevy powerplant was represented at Beech Bend, including everything from the smallest of small-block V8s, to 409s, and stroker big blocks. Chevy power is the primary choice of drag racers in the nostalgia world, just like it was at drag strips years ago. Drag racers on parade. A '40 Chevy coupe works the drag strip, a '67 Camaro launches hard, a '63 long-roof runs low 12's, and a '57 Chevy sedan delivery Jr. Stocker on display. A holdover from the days when the honoree reception was held at the Sloan Convention Center, is an impromptu cruise-in that spontaneously appears in the parking lot. This year was no exception, and provided another opportunity to admire the street cars while taking the time to visit area restaurants and socialize in a more laid-back atmosphere. This beautiful 1937 Chevy coupe, in full gasser trim, was powered by a rare Arias Hemi-headed Chevy, and Chevy street rods were well represented by this 1939 sedan, and the Kelly Green woody wagon in the Axalta Show 'N shine. Jeff and Lisa Munford showed this awesome 1970 Chevy Camaro RS in the Axalta Show ‘N Shine and picked up a Top-25 award in the process. The finals of the nitro classes brought the racing action to an end on Saturday evening, just before a parade of Axalta Show ‘N Shine winners took to the track for their recognition. The Cacklefest closed out the evening to bring the 2018 National Hot Rod Reunion to a conclusion. The Cacklefest is always a crowd pleasing activity, in which, vintage Top Fuel dragsters and other competition cars of yesteryear have the engines fired while they line the drag strip. Once the last car is in position, the assembled field of thundering horsepower is shut off, and the event is a wrap. More sights from the Show N' Shine. This nostalgic '57 Corvette was ready for action with a tunnel rammed rat motor. The turquoise '55 Chevy sedan was a low riding cruiser, while the '57 Chevy hardtop featured an eye-searing candy-red paint job. 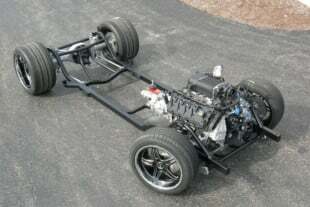 The straight axle Nova looks to be a good match-up for the copper Corvette. Paul Pyles brought this immaculate 1972 Chevy C10 to the NHRR and took home a Top-25 award in the Axalta Show ‘N Shine competition. The actual function of the National Hot Rod Reunion is to serve as a benefit for the NHRA Motorsports Museum located in Pomona, California. This long-standing popular event, along with the even older California Hot Rod Reunion held in Bakersfield, California, provides much needed financial props to the museum’s mission of celebrating the impact of motorsports on American culture. While the museum is obviously rooted in drag racing history, it also features displays honoring the impact of other forms of motorsports, as well as American car culture as a way of life. George Poteet brought this super-nice Chevy Suburban from his Holly Springs, Mississippi car farm. Vintage Pro Stock action with the Reher & Morrison Camaro. 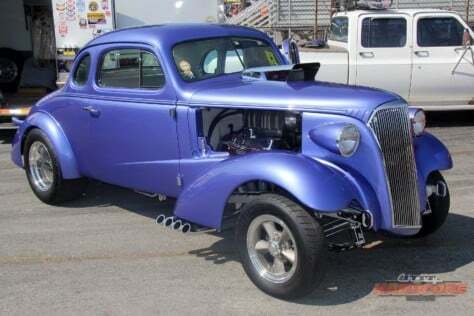 A flamboyant 409-powered Chevy coupe. A candy red Corvette waits in the staging lanes, and a slick '66 Chevelle motors through the Show 'N Shine area. You need to make a point of taking in one of the NHRA’s hot rod reunions. It’s a fun-filled experience and a hot rod history lesson rolled into one active race weekend. The NHRA has aptly described the reunion as a “living museum,” but I like to think of it as history in action. Holley Hot Rod Reunion Coming To Kentucky, June 13-15, 2013!